iGigBook ties it all together; real books, fake books, tranposing chord charts, and single sheets. All of it at your fingertips, in real time, on any gig. FREE BONUS! Over 1,300 chord charts of your favorite Jazz Standards that you can transpose to any key. Use them to expand your existing sheet music library or get your music library started. Need a Hands Free page turner? Get the iGigBook Pager app and use your iPhone or iPod Touch to turn pages hands free. iGigBook is the musicians choice for managing individual sheets of music, music scores, chord charts that transpose, lyric charts, fake books and real books. 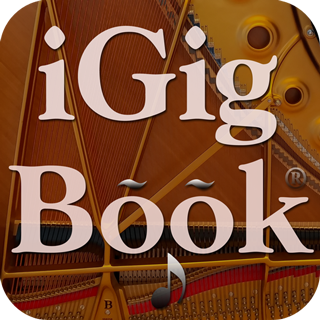 Designed by gigging musicians for gigging musicians, iGigBook features a powerful search engine that provides indexes of popular fake books and real books to help you to instantly find the one song that you need among the thousands contained in your sheet music library. iGigBook works like the powerful search engines that you've used for finding stuff on the web. Start typing in the name of a song and search results from over 70 books appear so that you can choose the best arrangement that you have available. No other app but iGigBook can allow you to find, in seconds, all versions of "Autumn Leaves" or all of the songs by Antonio Carlos Jobim, Duke Ellington or Charlie Parker. 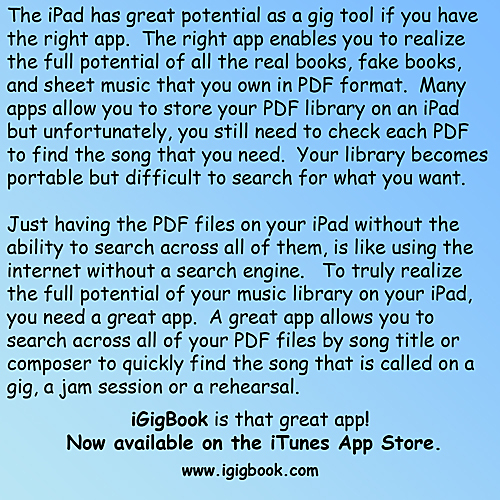 With iGigBook on your iPad, you can show up to any gig, confident, that when the tune is called, you can have it up and ready to play while others are still flipping through physical or electronic pages. Now is the perfect time to get your hands on the perfect jam session tool and the only app that allows you to find in seconds that needle in a haystack tune buried deep inside your vast sheet music collection. Full Featured Metronome - Select tempo, beats per measure, beat pattern, bars to play and automate pages turns. Advanced Book Indexing System - iGigBook has over 70 popular Jazz Fake Books and Real Books indexed for you and ready to go, just add your book and find what you need in seconds. Single Book Index System - iGigBook allows you to easily access Bb, C, Eb and Bass Clef versions of any book using a single index. Individual Score Organizer - No books? No problem. Our convenient "My Scores" view allows you to easily download your content from the cloud and search for all of your un-indexed scores. Download from iCloud, Dropbox or Google Drive - The Book List view can use any one of the popular Cloud storage providers to do the downloading and linking to the index for you making it even easier to get ready set for the gig. Chord Charts Than Transpose - Over 1300 chord charts of Jazz Standards that you can transpose to any key. Multi Book Search - iGigBook finds all of the songs in all of the books so that you can pick the best representation and arrangement that you have. Song Title Search - Find the song you want in seconds, no matter which of your books it's located in! Composer Search - Find all of the tunes by Antonio Carlos Jobim or any other composer. Share Your Set Lists - Email your Set List to your band members. Link Music To Your Charts - Search and play tunes from your music library that match the title of the chart that your are viewing. Annotation/Notes - You can add notes to any score, highlight Repeats, D.S., D.C., Coda, etc. Annotated score can be emailed to other band members. Set List Manager - Create sets, arrange items in your set, add or remove items from your set. Set List Viewer - Display items in your set to quickly access what you will perform. Intelligent Score Navigation - Set where the repeats, D.S., D.C., and Codas are and iGigBook does the jumping for you. PDF Book Builder - Create a custom gig book from items in your Set List and email it to your band members. Bookmarks - Easily bookmark any page or group of pages in a larger score and place that item in a set list. Import PDF Table of Contents - iGigBook can import the table of contents of any PDF and automatically create bookmarks for you. True Full Page Display - No menu bars, footers, status bars, just the sheet music. Zoom level lock - Pinch zoom to make it big and sharp, then lock it down for all subsequent pages. Import From Email, iCloud, Dropbox or Google Drive - iGigBook allows you to add and remove content to and from your device without using iTunes. Password Protected PDF Support - Great for publishers of all sizes that want to make content available but keep it protected. iGigBook lets you select the users you want to access the content you have rights to. Turn Pages Wirelessly/Hands Free - Built in support for Bluetooth keyboards, foot switch devices emulating one or the iRig BlueBoard. * iGigBook does not provide any PDF content, you the user must provide your own PDF content.